Law School lecturer Adam Mortara, lead trial counsel representing plaintiffs in Students for Fair Admissions v. Harvard, likened the bias of Harvard’s admissions office against Asian-American students to an imaginary Taser that kills Black people but only stuns white, Hispanic, and Asian people. He made the analogy at a University of Chicago Federalist Society event on Monday to stress his claim that Harvard knowingly used an admissions process biased against Asian-American applicants. Mortara’s team says that white, Hispanic, and Black applicants averaged higher marks that Asian-American applicants in the “personal rating” component Harvard used to evaluate applications. The plaintiffs Mortara represents allege that Harvard routinely discriminates against Asian-American applicants by imposing informal quotas to restrict their admissions numbers. 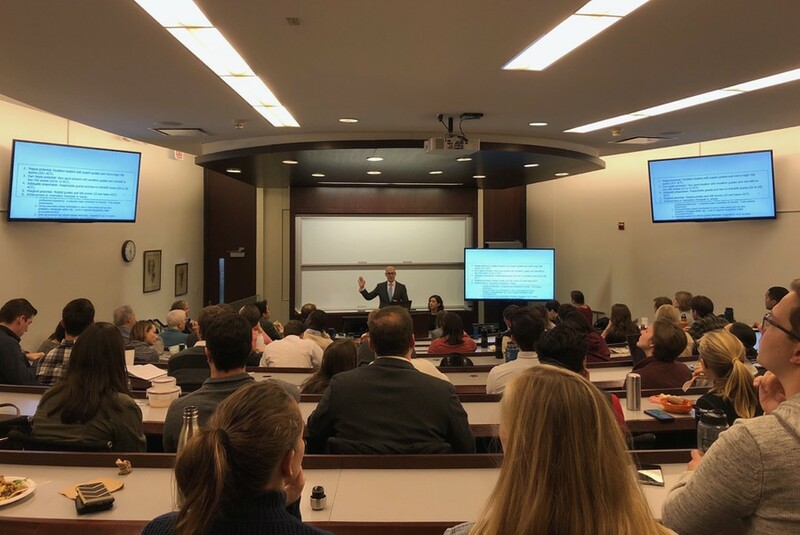 Mortara’s presentation to more than a hundred students focused on data that Students for Fair Admissions has used in the lawsuit to argue that Asian-American students are disadvantaged in the personal rating component of application evaluations. Mortara acknowledged in his talk that it’s possible Harvard did not know Asian students were disadvantaged until internal reports showed so in 2013, before the lawsuit began. However, he argues that after the internal reports were produced that year, they knew they were using an unfair system. “One way in which I’ve discussed this with [my] team from time to time is whether it’s possible that Harvard didn’t know that any of this stuff was happening before they got all these reports. Is it possible it was just sort of implicit bias, unconscious bias operating?” he said. In Mortara’s analogy, the person using the Taser is told it kills Black people, but uses it anyway to shoot criminals at night. His point was to emphasize that Harvard knew its system disadvantaged Asian-American students and that Harvard was content with this. Mortara argued that regardless of what you think about Harvard’s practices prior to the internal reports on race in admissions, the problem was obvious when they continued to use their admissions system with no changes. “They demonstrated that they actually like the results they’re getting from the racist Taser, from their admissions process, and their deployment of this personal rating,” he said. During the Q&A session after his talk, Mortara cited an e-mail Yale’s director of admissions sent out saying its admissions office doesn’t use a personality rating, and then suggested in a joking manner that Yale thinks Students for Fair Admissions would bring legal action against them next.